On the Home page click either of the Sign Up buttons. Then enter a username, your name, email address and a password into the form and click the “Sign Up” button. Usernames must be at least seven characters and there can only be one user for each email account. A verification email will be sent to the email specified in the form. Check your junk or spam mail folders if you do not receive an email within a few minutes. Clicking the link brings the user to a Science Writer Welcome page. Click the Start a New Project button to start a Science Writer project. Click on the “Forgot Your Password” link at the top of the home screen. Enter your email address and an email will be sent to you with a link to reset your password. Your username will be in the greeting of the email. If you do not receive an email within a few minutes check your spam or junk mail folders and filters. Click on "Take a Tour" on the Home page for a video tour of Science Writer features and how Science Writer can help you become a better science report writer. Science Writer is an interactive, web-based instructional learning tool designed to help students in writing a complete science report; it supports students throughout the process of writing a science report. Research has revealed several effective instructional practices in improving the written language performance of students, and Science Writer has been designed to provide these. Science Writer is a technology-based learning environment that can provide plentiful opportunities for practice—a critical element to successful reading or writing strategy instruction. Science Writer enables students to demonstrate their knowledge of science concepts through writing, structures the writing processes as it relates to content-area writing, structures the thought process required for scientific writing, provides opportunities for structured practice and utilizes the Universal Design for Learning (UDL) Framework to meet the needs of a wide range of students. Science Writer’s Agent characters, Max, Sam and Eko, provide tailored support. Max and Sam give students a model and the reasoning behind it, and Eko gives students specific hints on how to proceed. Additional support and tools are detailed throughout this manual. "Start a New Project" button at the top of the Home page. If you already have an account, just login and you are automatically brought to the "Project Home" page. To create a new project you must enter a name for the project in the Project Name textbox. The name will appear on the Project Home screen, at the top of all the writing screens and on the printed versions of the report. Next, you should decide what the section names for your report are. The default names for the sections are: Research Question, Introduction, Methods, Results and Conclusion. You may change these names using the pulldown menus. Research Question can be alternately named Hypothesis. Introduction can be alternately named Thesis. Methods can be alternately named Procedures. Results does not have an alternate name. Conclusion can be alternately named Discussion. You will be able to edit the Project Name on any of the writing pages using the "rename" link next to the name. You may rename the section names by going to the Project Home page and clicking the "rename" link next to the section name. 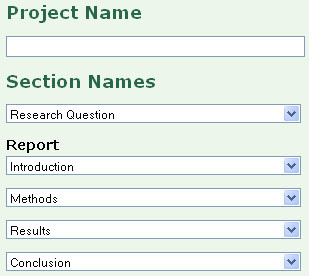 Once you have gone through the steps of creating a project you may return to the Project Overview page to view all the parts of your science report together. Use the section name links to navigate to the different sections of the report. Use the rename link to rename a section name. Print or email the report using the links on the left side of the screen. There is a "Project Home" button at the top of all Science Writer pages. The Project Home screen lists all your saved reports. The user has the ability to print, email or delete a project.Clicking on the name link to will take the user to the Project Overview page. Click the "Start a New Project" button to start a new science report. Science Writer breaks a science report into smaller parts to help you focus on specific tasks and prevent being overwhelmed. Each section of the report has specific directions, hints and models. There are checklists on the revise and edit screens. For each section of the science report there are draft, revise and edit pages with different supports for writers going through the writing process. The “Help Me Get Started” button appears above text boxes in Draft sections of Science Writer. Think of it as a way to help start the writing. 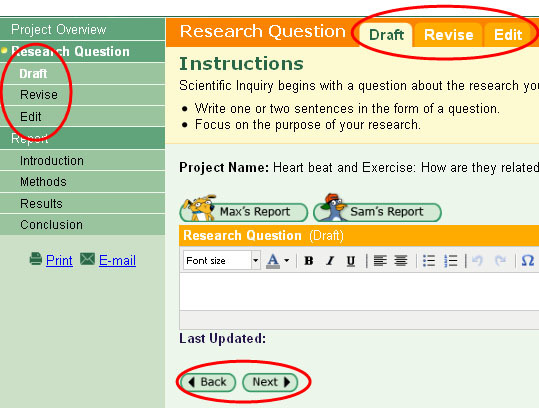 Click on the "Help Me Get Started" button to have separate textboxes for each topic in the section of the science report. Sentence starters for each topic will be available above the textbox of topic. Use the pulldown menu to choose a sentence starter, then click "select" to insert it into the textbox. The sentence starters can be edited once they are in the textbox. Navigate to the next screen to view all the work for that section in the same textbox. The checklists are a set of questions on all the revise and edit screens. Read the questions in the checklist and review your writing. Make any needed changes to meet requirements for that section of the science report. Click in the check boxes next to the questions as the work has been checked. Use the Revising Checklist for help with writing the content of the report. Use the Mechanics checklist to help correct the mechanics of your writing (for example, spelling and grammar). Use the text-to-speech tool bar to have words on the screen read to you. It is especially helpful to check your work by hearing it read aloud to you. Highlight the text then click the green triangle play button to hear text read aloud. The double blue bars are to pause the reading. The red square stops the reading. To get a definition for a word highlight or double click it then click the book icon in the tool bar. To get a Spanish translation of a word highlight or double click it then click the double arrow icon in the tool bar. Click on Eko’s Hint to hear clear instructions for each page or to support you using the checklists. Click on Max’s Report to see an example of a science report and hear what Max the dog thinks about while he is writing it. Click on Sam’s Report to see another example of a science report and hear how Sam the penguin thinks as he is going through the process of writing. Click on the "ABC" icon in the textbox tool bar to access spell checking. Misspelled words will appear with red underlines. Click on a word to get suggestions for correct spelling. The journal can be used to keep notes, reflect on the progress of the project, collect data or other pertinent information. Journal entries are listed in reverse chronological order and can be edited but not deleted. Your work in the journal is autosaved every 60 seconds. There are three ways to navigate through the draft, revise and edit pages for each section of the report: left hand navigation links, draft/revise/edit tabs at the top or "next" and "back" buttons below the textbox. All of the text typed into the textboxes in the report writing screens and the journal are saved every sixty seconds. A date/time stamp appears below the textbox as the saving happens. This is done so that if, for example, Internet connection is lost while working never more than a minute's worth of work is lost. Your work is also automatically saved when you navigate through the writing pages. You can use the "Save" button to save your work too. You may share your science reports with teachers, friends and family by emailing it to them or printing it out. Use the email or print links on the project home page or in the left navigation. To print out a report click the print link which opens a window with a print preview of the report, then click the "Print" button on the top right side of the page.